[Ljubljana, Slovenia – 19 October 2018] Mission Hills Haikou in China has been named Asia Pacific Golf Resort of the Year by IAGTO, the world’s leading golf tourism organization. The result of a vote by more than 600 international golf tour operators was announced at the prestigious IAGTO Awards ceremony in Slovenia during the International Golf Travel Market (IGTM). Mission Hills Haikou is part of the Mission Hills Group which also owns and operates Mission Hills Shenzhen in southern China, named ‘Golf Resort of the Year – Rest of the World’ by IAGTO in 2006. Together, the fully-integrated luxury resorts span a total of 40 square kilometers and 22 golf courses, making Mission Hills the largest golf facility in the world. “2018 has been significant for Hainan with a number of reforms announced to further boost the province as an International Tourism Island. This includes visa-free entry for 59 countries which is more great news for golf tourism on the tropical island known as China’s Hawaii. “Mission Hills itself has also had another memorable year. Not only do we continue to provide world-class golf across 10 championship courses in Haikou – all of them public – but we also strive to offer golfers the very best for relaxation and recovery, including our world-record 168 volcanic mineral springs, our luxury spas and our five-star dining experiences. For those who are more adventurous, we opened China’s first Wet’n’Wild theme park this year with 30 iconic slides, pools and attractions, operated by Australia’s Village Roadshow. Located close to Hainan’s capital city, Mission Hills Haikou is recognized by the Guinness Records as the world’s largest public golf facility with 10 courses, including the flagship Blackstone Course, host to historic championships including two World Cups, six World Ladies Championships, four World Celebrity Pro-Ams and the Match at Mission Hills between Tiger Woods and Rory McIlroy in 2013. The Blackstone Course at Mission Hills Haikou recently entered Golf Digest's 100 Greatest Golf Courses for the first time at number 48. IAGTO (International Association of Golf Tour Operators) is the global trade organization of the golf tourism industry, having been established in 1997. It has over 2700 members in 105 countries including, at its core, 690 golf tour operator members in 64 countries, which control more than 85% of golf holiday packages sold worldwide and which collectively have annual sales of over US$2.3 billion. IAGTO runs annual Asia and North America Golf Tourism Conventions, along with regular Destination Conventions. IAGTO established the International Golf Travel Market, now owned and operated by Reed Travel Exhibitions, in 1997 and the International Golf Travel Writers Association in 2000. IAGTO also runs the prestigious annual IAGTO Awards and the IAGTO Excellence Awards. Mission Hills Group, owner and operator of Mission Hills resorts in the heart of the Pearl River Delta and on the tropical island of Hainan, is synonymous with leisure, wellness, entertainment and luxury. 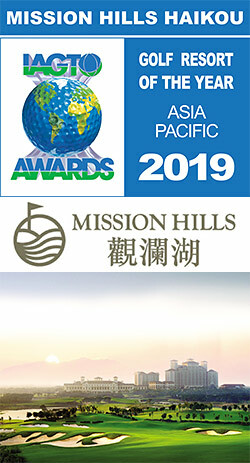 Founded in 1992, Mission Hills is recognized as one of the world’s leading golf brands and a pioneer in China’s hospitality, sports and leisure industry. The world-class integrated leisure and wellness resort destinations have hosted more than 100 international tournaments, dating back to the World Cup of Golf in 1995, the first international golf tournament in China. Mission Hills has also been accredited by the Guinness World Records as the “World’s Largest Golf Club” and the “World’s Largest Mineral Springs and Spa Resort”. Mission Hills’ properties sprawl over 40 square kilometres. They include 22 championship courses designed by renowned players and architects from five continents, five-star resorts, award-winning spas and volcanic mineral springs, international convention centres, state-of-the-art golf academies, a 20-pitch football training base, Asia’s largest basketball school and Asia’s biggest tennis facility. Mission Hills is also the official training headquarters for China’s Tennis, Football and Golf Associations. The Group’s ‘golf and more’ leisure philosophy has seen its tourism-related business expand into a leisure hub for multi-generational families. Mission Hills Centreville in Shenzhen and Haikou provides integrated shopping, recreational, business, education, entertainment, leisure and cultural experiences, including Bromsgrove School Mission Hills in Shenzhen in collaboration with the historic British boarding school. Mission Hills has also extended its foray into the hospitality industry by partnering with world-renowned hotel brands such as Hard Rock, Renaissance and Ritz-Carlton. These collaborations have seen the opening of Ritz-Carlton’s first golf resort hotel in China and China’s first Hard Rock Hotel in Shenzhen. Other significant projects include Movie Town in Haikou in partnership with China’s largest film production company, Huayi Brothers Media Corporation and award-winning director, Feng Xiaogang and China’s first Wet’n’Wild water park in collaboration with Australia’s leading entertainment group and largest theme park operator, Village Roadshow Limited. Mission Hills has also announced ground-breaking partnerships with FC Barcelona and the NBA to bring the world’s most famous football club and the world’s largest professional basketball league to its Haikou resort, making Hainan island a leading hub for football and basketball development in China. For more information and latest updates, visit www.missionhillschina.com or follow Mission Hills China on Facebook, Instagram, LinkedIn, Twitter and YouTube.